Happy Halloween! From urban-sized electric vehicles for the developed world to a cardboard bicycle that could have a transformative effect in the developing world, this October we have a newsletter chock full of transportation to move you. Five HOGs act as a water storage supply for ELT Easy Green’s living wall in downtown Toronto. See how it’s done in our video update (compliments of Greg Garner from ELT Easy Green) from the Toronto Dominion Centre. And four HOGs provide rainwater and grey water storage for an urban home in the Philippines, designed by Buensalido Architects. The stark simplicity of the home shows contemporary Filipino architecture in its best light – the natural kind (from windows and skylights throughout the home). Take a video tour; the HOGs come on at minute 5:57. And Greenbuild is just around the corner! We’re looking forward to seeing you there. Rainwater HOG will be exhibiting at Greenbuild 2012. Meet Sally and Simon Dominguez of Rainwater HOG this November in San Francisco. Catch up on the newest innovations and trends at the world’s largest green building conference. We’re busy planning our booth and looking forward to seeing friends, old and new! The ELT Easy Green living wall at the Toronto Dominion Centre is in bloom! We first introduced the the stand-alone green wall, built in front of the Toronto Dominion Bank, in our July edition. The wall commemorates the launch of the Green Portal, an online tool that charts the energy use of the TDC’s six towers in real time. Watch the video update here. Get views of downtown Toronto – the TDC is one of the largest commercial developments in North America – and see how the green wall was constructed. And check out the HOG tanks showing off their slim-lined versatility. Five HOGs hidden inside ELT’s Easy Green wall at the Toronto Dominion Centre, at left, keepin’ it green. Jason Buensalido describes the Buensalido Architects home in Manila, Philippines as, “basically an honest house.” He’s fused modern materials – steel, concrete, and glass – with contemporary Filipino architectural values – natural ventilation, an open floor plan – to create a sleek and airy modern residence. 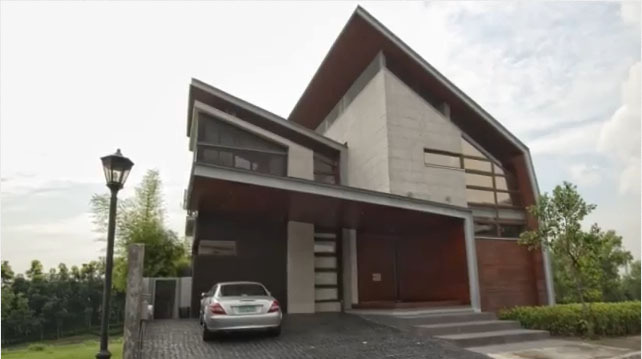 Urban Zone take you on a tour of the home with architect Jason Buensalido. Watch the video here. The HOG tanks are featured 5:57 minutes in. Four Rainwater HOG tanks are installed in the Buensalido Architects designed home. Jason Buensalido calls the HOG tanks an “aesthetically pleasing” way to demonstrate the water-wise ethos of the home. The water they capture is used to irrigate the yard, and to flush the toilets. The four HOGs for Buensalido Architects were provided by ISA Greenpath Enterprises Inc., Rainwater HOG distributor for the Philippines. Sally Dominguez, HOG Designer and car journalist, attended the 2012 Paris Motor Show. While there, she took the Renault Twizy, a pocket-sized electric vehicle for a spin around the city. Put a smile on your dial with this video of Sally navigating the streets of Paris in the Twizy. Paris may be literally jam-packed, and its a fact that insurance companies refuse to insure vehicles using the ring road around the Arc de Triumphe, but the city is not all a’ pied. The Paris Motor Show had a dedicated track for alternative fuel vehicles…and a “4D” rally car simulation including rocking seats and lots of water spray if you found the electric vehicles too timid. Peugeot showed a brilliant concept supercar made from copper, steel, felt and pressed paper, and Renault handed me a Twizy quadricycle for a tootle around town. From the fabled Metro to the public “green bikes” you can ride for the swipe of a card..so many transportation options! Vive le Paris! And don’t miss her Twizy First Drive Review in the Sydney Morning Herald! Inventor Izhar Gafni has united an extremely useful and versatile material (cardboard) with a universally used product (the bicycle) to create a transportation option that could profoundly affect the developing world. Gafni calls his cardboard bicycle the Alfa. Watch a video of Gafni and the Alfa in action. Why is it beautiful? To paraphrase Modernist architect Louis Sullivan, it’s a beautiful thing when form is such a true expression of function. What makes Gafni’s Alfa bike beautiful is its intent, and its structural elegance in using a small amount of cardboard to carry large loads, in a recognizable form. Why is it useful? A thick layer of waterproof paint ensures that the bike is as robust as possible, and it costs less than $12 to make. Biking covers a distance around five times fast than walking, and the low price means that this economy of time can be brought to a demographic who can not afford it otherwise. Where is it at? After three years and several patent applications, Gafni is now fundraising with financial service provider ERB to produce the Alfa in adult and child versions.